The COS archery team was invited to demonstrate and teach area Girl Scouts how to shoot archery with the NASP rules. The training is being held on our campus. 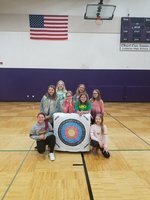 Thank you to Coach Rahlfs and COS archer Riley Smith for working with the next generation of archers.